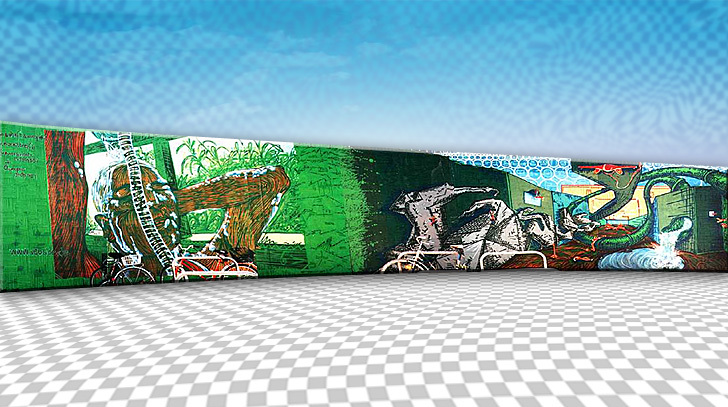 This is a giant mural, painted in 2000 at the front of the public indoor pool "Grünauer Welle" in Grünau, a district of Leipzig. On the left, you can see probably a female person while taking a shower and on the right there is a surrealistic landscape which is steeped by a huge water slide. The People of the scenery doing some sports like bungee-jumping, golf or climbing.